When I found myself on a commission to Kardamyli, in the upper Mani peninsula in Greece, I had to do one thing: visit Bruce Chatwin’s grave. Well, not exactly grave. Bruce Chatwin almost became an Orthodox Christian on his deathbed, but still he was cremated according to Anglican custom. 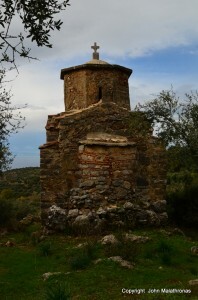 The Greek Orthodox church does not allow cremations, so his ashes were buried (not scattered) by the small church of Aghios Nicolaos in the village of Xohori, 8km north of Kardamyli. 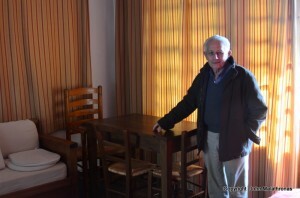 Chatwin lived in Kardamyli during the winter of 1985 and finished his book Songlines on a typewriter in Room Number One of Hotel Kalamitsi. 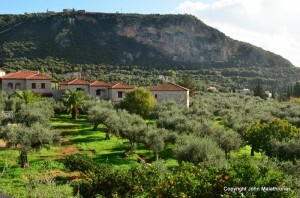 He used to hike up the Taygetos mountain to Xohori very often and stare at the Messinian Bay below for inspiration. Nikos, the owner, who knew him well and whose wife prepared broad bean soup (fasolada) for Chatwin, told me how to find the place where his ashes are buried. I followed Niko’s instructions. I drove on the road south until I found the turning to Xohori. Onwards for 6km, past the village of Proasteion, I eventually entered Xohori; 50m before the school I looked to my left and saw the tiny, remote church of Aghios Nicolaos. I drove around the school until the road finished. Then I walked in the direction of the church through a makeshift wooden farm gate. “I buried Chatwin’s ashes outside the church, to the right of the sanctuary (namely the eastern alcove in Byzantine-style churches).” Nikos had said. Some wild mountain flowers marked the spot today. I’m afraid this is a typical Greek stretching of the truth; Bruce Chatwin’s ashes were buried by his wife Elizabeth and Paddy Leigh Fermor, under an olive tree on a lower level than the church, to the right as you face the sea, near a bit where they tend to throw bits of rubble and tree cuttings down from the church level; Paddy liked the fact that near a sort of back rubbishy bit there secretly lay ‘this treasure’. This is well known and documented in biographies, letters and even a lovelyTV programme, ‘In the Footsteps of Bruce Chatwin’ where Paddy went back and indicated roughly the spot to Nicholas Shakespeare I think it was (Chatwin’s biographer). Sweet, but don’t believe everything Greeks tell you in regard to their connection with famous people! This may be so, but it doesn’t take anything away from my own personal pilgrimage. Absolutely! I didn’t mean to sound negative, which on re-reading my comment I think I might have done, so sorry John. Loved reading your account.